Come and join us in the beautiful SOUTH for what is regarded as possibly the funnest training camp of the year, and hone your orienteering skills, run in some cool forests and see some magnificent mountains. 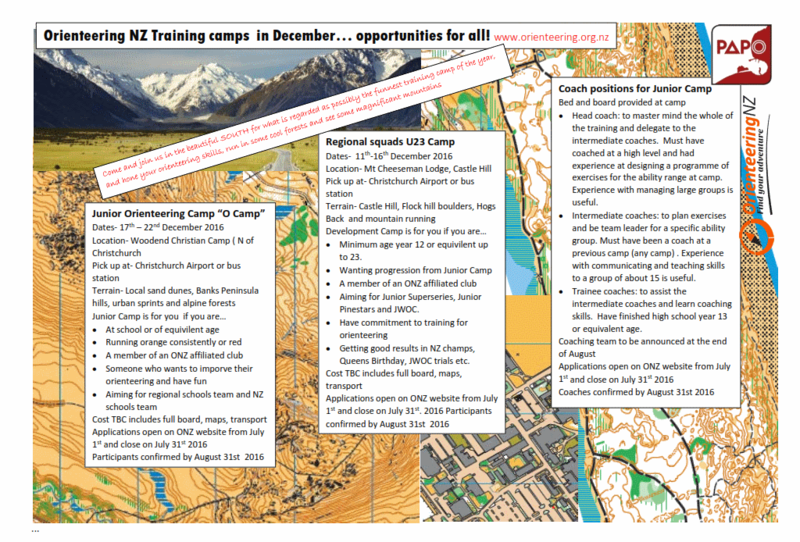 This year both the Orienteering NZ National Junior Camp and the ONZ Under 23 Regional Squads Camp will be held in Canterbury, December 2016. The camps are open to High School Students year 9 and above. Please note entries close on 31 July 2016. Prices are still to be confirmed, dependent on numbers and funding applications. Minimum age year 12 or equivalent up to 23. Aiming for Junior SuperSeries, Junior Pinestars and JWOC. Getting good results in NZ champs, Queens Birthday, JWOC trials etc. Applications open on ONZ website from July 1st and close on July 31st 2016. Participants confirmed by August 31st 2016. To master mind the whole of the training and delegate to the intermediate coaches. Must have coached at a high level and had experience at designing a programme of exercises for the ability range at camp. Experience with managing large groups is useful. To plan exercises and be team leader for a specific ability group. Must have been a coach at a previous camp (any camp). Experience with communicating and teaching skills to a group of about 15 is useful. to assist the intermediate coaches and learn coaching skills. Have finished high school year 13 or equivalent age. Coaching team to be announced at the end of August. Applications open on ONZ website from July 1st and close on July 31st 2016. Coaches confirmed by August 31st 2016.